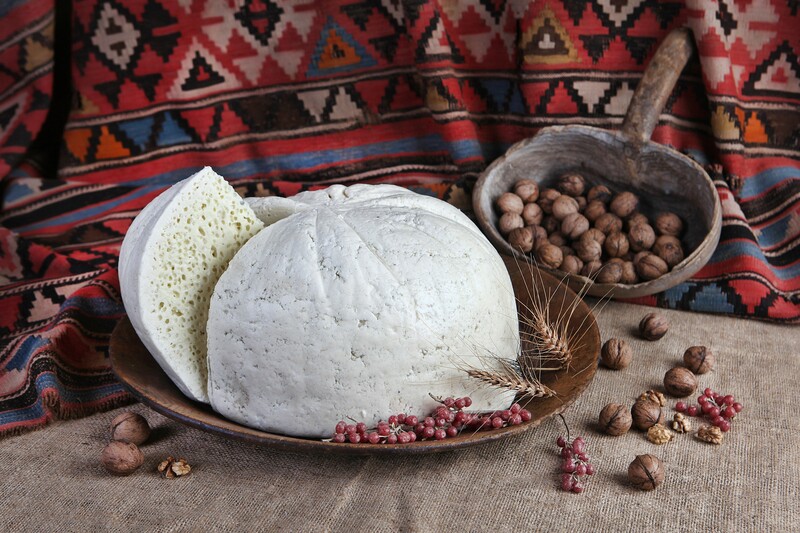 Archive » Tushuri Guda: Better Times Ahead for One of Georgia’s Oldest, Most Abused Cheeses? Tushuri Guda: Better Times Ahead for One of Georgia’s Oldest, Most Abused Cheeses? Small-scale cheesemakers in Georgia have had a hard time competing with big dairy. But one special cheese is managing to fight back. 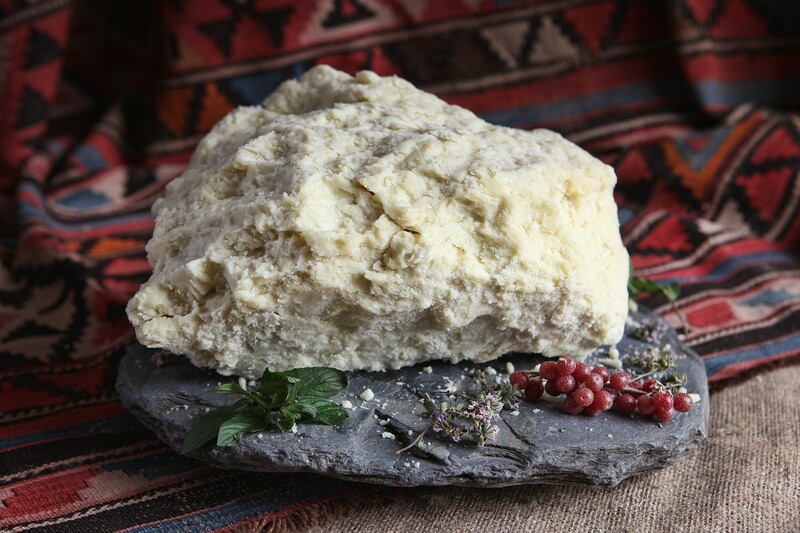 Produced in the remote mountainous region of Tusheti, Tushuri guda takes its name from the sheepskin sack in which the raw-milk cheese is traditionally ripened. The skin is turned inside out, so the wool is in direct contact with the ripening cheese. Archaeological evidence suggests that sheep cheese made in a similar way existed in present-day Georgia as long as 6,000 years ago; and a particular native breed of Tusheti sheep on which guda relies for its unique richness, flavor, and aroma has been continuously raised and grazed on the lush mountain grass here for almost 1,000 years. However, most of the cheese passing as guda you buy in Georgia today comes from producers who take shortcuts, such as large industrial dairy companies. They seldom use milk from Tusheti sheep bred in the mountains, but rather from higher yielding breeds of sheep or cow who solely graze paddocks down in the valleys and plains, which are often tainted with pesticides. Worst of all, these industrial producers replace the traditional sheepskin sack for maturing the cheese with polyethylene bags. 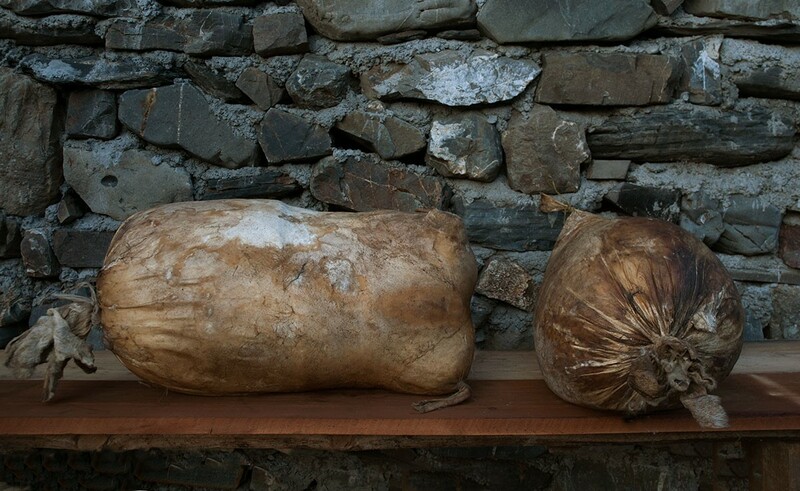 Plastic does not breathe, nor possess any of the microflora present on the inverted Tusheti sheepskin, and ripening in this way results in a cheese that can hardly even be called similar to Tushuri guda, let alone the same. However, all is not lost. There are still shepherds and cheesemakers living in Tusheti, some recently returned from the cities or other regions, who are making Tushetian guda in the traditional way. And they are fighting to restore pride in the name of their cheese. A few years ago, in order to pool resources and help their voice be heard above the din of the big boys, several small-scale producers joined forces to create a Tushuri Guda association. One of the biggest obstacles for artisanal Georgian cheeses – especially regarding export overseas – is food safety certification. It is always difficult for small-scale producers to prove that their process and product is safe (even if they’ve been doing it that way for 6,000 years). All around the world, broad-sweep hygiene rules like pasteurisation, refrigerated storage, chemical disinfection, and using steel instead of wooden surfaces are a good, easy way for legislators to ensure that all products on the market are free from contamination of harmful bacteria. It’s also a good way to kill the special character of many of these products. Europe, for instance, is a huge potential market for artisanal Georgian cheeses, but food safety concerns are currently holding this back. EU directives EC 852 / 2004, EC 853 / 2004 and EC 854 / 2004 are the particular pieces of European legislation that deal with food safety standards in the dairy industry, and they are the main model being used to ensure Georgia’s artisanal cheeses comply with internationally recognised standards. These documents favour large-scale industrial production and sterile factory conditions. But if you can prove that your cheese is perfectly safe using other, traditional methods, you can get around it. For example, in 2004 these EU directives forced Italian gorgonzola producers to mature their cheese on steel plates rather than the traditional wooden boards. This resulted in bland cheeses and backlash from consumers, so gorgonzola was allowed to return to the old wooden maturing boards while still satisfying the food safety regulations. Tushuri guda could achieve a similar compromise with food safety standards provided they can state their case loudly enough for the relevant legislators, inspectors, customs officers and other authorities to listen. For this, they have some strong supporters already on board. 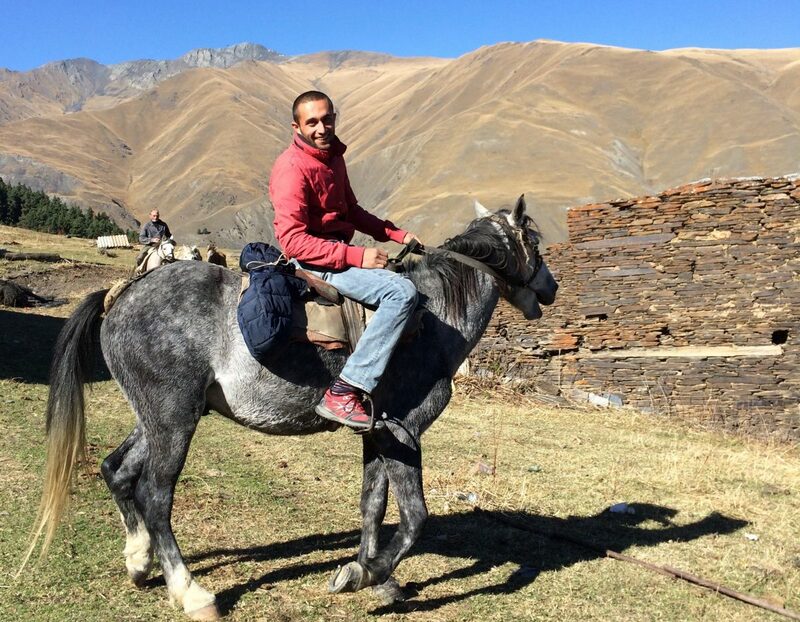 In 2017 a group of international food safety experts – including UN FAO, European Union, and Slow Food consultants or representatives – visited the artisan Tushuri guda facilities in Tusheti to learn more about how the cheese is made. Following this visit, suggestions for improving hygiene standards – without drastically altering the way their cheese has been made for centuries – have been passed onto Tusheti cheesemakers through ongoing workshops held by Tbilisi-based agricultural NGO Elkana. At the same time, these groups (together with the Georgian Ministry of Agriculture and the National Intellectual Property Centre) are working together on a project to strengthen the framework for registering Georgian products under the EU’s Protected Geographical Indication (PGI) and Protected Designation of Origin (PDO) schemes, using Tushuri guda and sulguni cheese as the two pilot products. Achieving the upgrade from PGI to PDO for Tushuri guda would first of all ensure that only cheeses possessing specific organoleptic characteristics, made according to clearly defined traditional practices — above all, the use of traditional Tushetian sheepskin guda sacks for maturing the cheese instead of plastic bags — could be labelled as certified Tushuri guda. In addition, this designation (and the distinctive red and yellow PDO label that comes with it) would go a long way to helping open up exports of Georgian animal products not only to the EU, but around the world. After all, it’s not only in the EU where interest in authentic Tushetian guda is growing. The Alaznistavi cooperative of traditional guda cheesemakers has already exported one of their cheeses, in small amounts, to the United States (which unlike the EU is open to the import of animal products from Georgia). And Tushetian guda garnered great acclaim at the global Slow Food Cheese festival in 2017, where 22-year-old Tushuri guda maker Kakha Abulidze accepted a prize on behalf of the Alaznistavi cooperative. Yet another young Tushetian cheesemaker, 27-year-old Giorgi Karsamaouli, has developed a reduced-salt process for making traditional Tushuri guda. He thinks this might be better suited, and more marketable, to some foreign taste palates than the original version, hoping it will provide income to help his family continue the traditions passed down to them through countless generations. For a cheese with a long past, Tushuri guda seems ready and willing to adapt to the modern world without losing touch with its heritage. And judging by the enthusiasm of these young cheesemakers, it seems that its future is in good hands.